AC Interference | Matcor, Inc.
What is the impact of AC interference on pipelines? The summary below includes video timeline indicators so you can easily find your topic of interest in the video. (0:25*) AC interference is an interaction that occurs between high voltage power lines and pipelines in a common utility corridor. *References the time in the AC Interference Video where this topic is reviewed. In the video, our AC mitigation expert Ted Huck explains fault currents and two modes of interaction with pipelines, conductive coupling and stress voltage. (1:09) Conductive Coupling is a relatively rare occurrence when there is a fault condition along the power transmission line and a large amount of electricity is dumped to the earth. 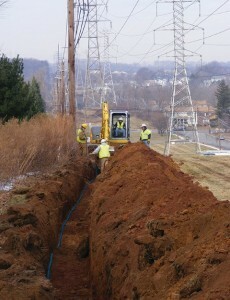 The collocated pipeline is subject to this discharge of electricity through arcing, defined as the flow of current through the soil. Although rare, conductive coupling can burn a hole through the pipeline and cause a catastrophic failure. (2:08 in the AC Interference video) Arcing depends on soil resistivity and voltage. 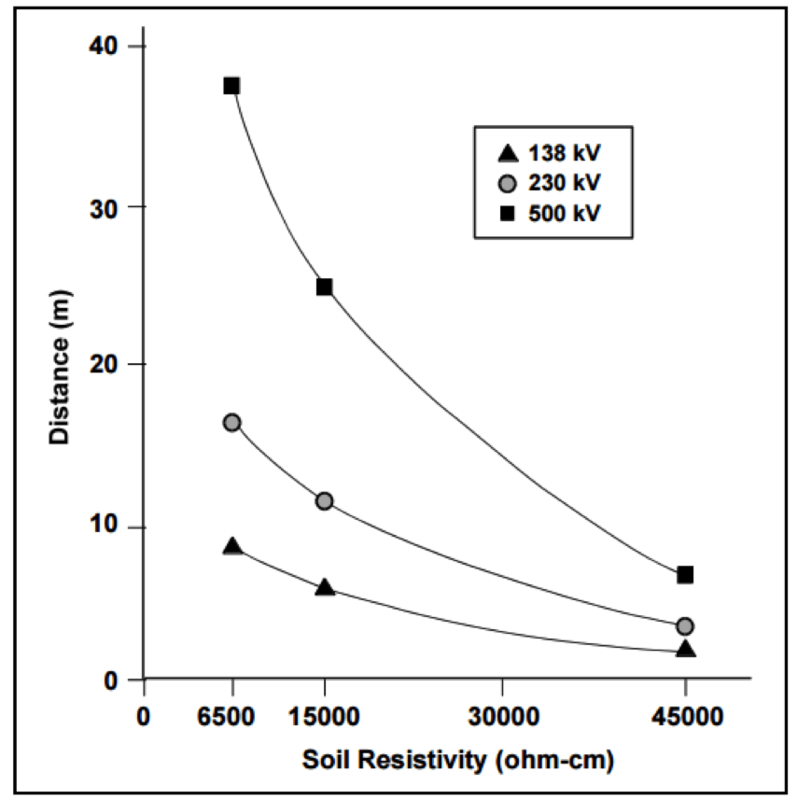 (2:49) We can predict how far arcing can occur through the soil by measuring soil resistivity and system voltage. (2:16) In this segment, our AC mitigation expert describes a real customer case scenario where arcing caused catastrophic failure of a gas pipeline. (4:01) Another issue that can occur with conductive coupling is a voltage rise radiating out from the location where the electricity is dumped to the earth. 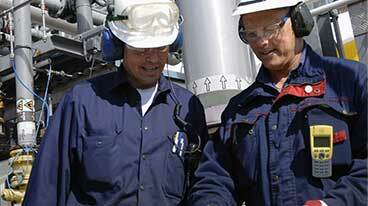 Newer pipeline coatings cannot handle excessive voltage stress. (4:41) Exceeding maximum voltage stress can damage the pipeline coating. (5:44) Electromagnetic Induction is a steady state occurrence where current flowing through the line creates an induced current flowing in the opposite direction along the parallel pipeline. 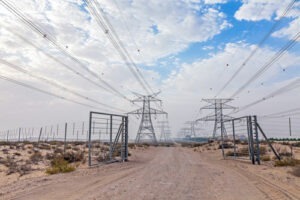 If the pipeline is close enough to the power transmission line, and runs parallel to it for some length, it will be in the electromagnetic field that exists around the AC transmission system. Being in that electromagnetic field, it will inductively pick up current throughout the longitudinal electrical field. 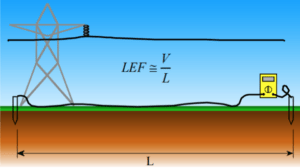 (6:56) The LEF field can be measured by running a copper cable along the pipeline and measuring the current. (7:26) AC induced corrosion occurs when alternating current is picked up by the pipeline that cannot effectively dissipate back to the earth. Well coated pipelines have very few places for the current to exit the pipeline and are at risk for significant, rapid AC corrosion. 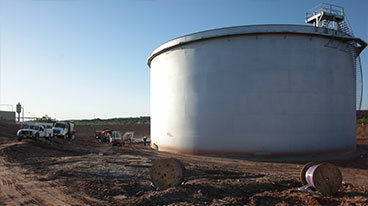 Older coating systems have many defects, or natural grounding points enabling AC on the pipeline to naturally dissipate, so AC corrosion is a relatively new concern. 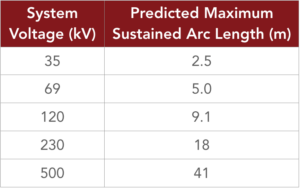 With newer coatings, AC current continues to build until it finds a small coating holiday (typically 1-3 cm2) to exit the pipeline, risking catastrophic failure. 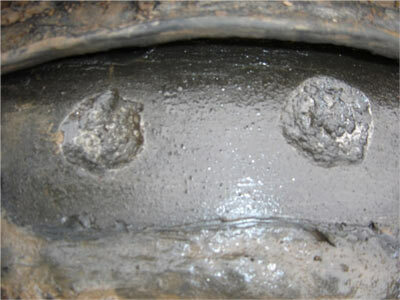 (9:00) AC induced corrosion on a pipeline appears as round craters in the pipeline coating. How likely is AC corrosion to occur? (9:43) We can determine the likelihood of AC induced corrosion based on the current density. 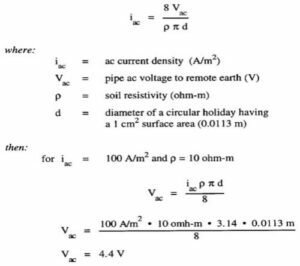 (10:05) This formula shows how to calculate current density for a given holiday size; our example is based on a holiday surface area of 1cm². In our example, 4.4 volts AC is all it takes to cause AC corrosion. With older pipeline coatings that threshold is in the 15 volts AC range. 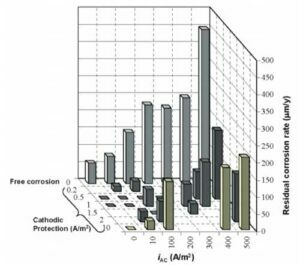 100 A/m² Threshold – When will AC corrosion occur? 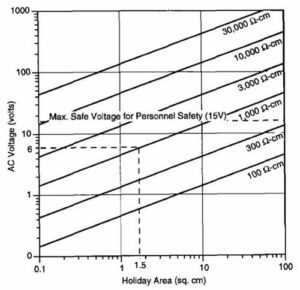 (11:37) This chart shows holiday size and AC voltage required to exceed the 100 A/m² AC corrosion threshold at varying soil resistivity. 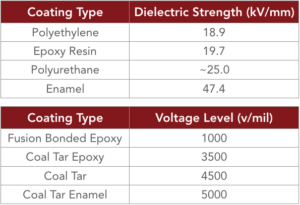 Refer to NACE Report 35110, AC Corrosion State-of-the-Art: Corrosion Rate, Mechanism, and Mitigation Requirements for additional information about the 100 A/m2 threshold. In Europe, refer to standard BS EN 15280:2013, evaluation of AC corrosion likelihood of buried pipelines applicable to cathodically protected pipelines. (12:35) Properly applied cathodic protection reduces induced AC corrosion risk. (12:50) Pipelines have above ground appurtenances such as valve stems and test stations that are subject to the AC currents picked up by the pipeline. These can pose a serious safety risk to workers, including shock or death. These risks are referred to as step and touch potential. 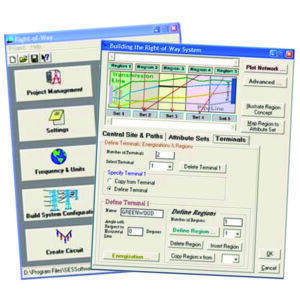 Touch Potential is defined as current flowing from touching an electrified device, through the body and down to the earth. (13:38) Step and touch potential can cause serious safety risks, including injury or death. A maximum of 15 volts is the industry standard threshold for safety. 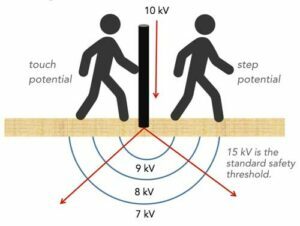 Step Potential can occur even without the worker touching the electrified device. In this case, current can flow up one foot, through the body and back down to the earth through the other foot, potentially causing serious injury or worse. Refer to NACE SP0177-2014 (formerly RP0177), Mitigation of Alternating Current and Lightning Effects on Metallic Structures and Corrosion Control Systems, Paragraph 5.2.1.1 for additional information on the 15 volt safety criteria. This AC interference video reviews the 3 basic effects of AC interference on pipelines, including the maximum 15 volt safety threshold—how much voltage can accumulate on the pipeline before it becomes a safety hazard to a person touching the pipeline? If there is more than 15 volts AC, we must do something to drop that voltage. Then there are rare but potentially catastrophic fault conditions, or the dumping of current to the earth. Finally there is AC induced corrosion, a result of the interaction of the electromagnetic field generated by current flowing through the lines and how it reacts with the pipeline. 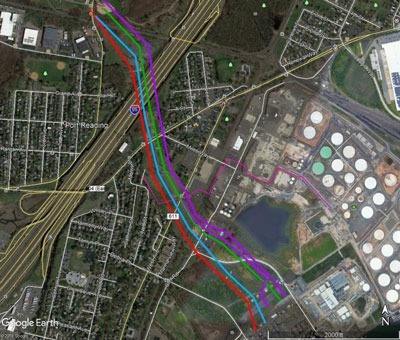 Pipeline operators must be prepared to mitigate these risks. Have questions after viewing our AC interference video, or need a quote to mitigate the risks of AC interference? Contact us at the link below.